Let’s get right down to the nitty gritty. Or in this case – dirty hair! We all want fresh, fabulous hair, but let’s be real, we all have gone for days on end with nothing but a bottle of dry shampoo holding us together. We may not be proud of it, but we sure have done it, myself included. That’s why I was so excited to hear about the new Pantene Charcoal Collection’s Shampoo and Conditioner. They are a duo of nutrient infused formulas with a Pro-V blend of activated charcoal, provitamin B5 and antioxidants. But what really intrigued me was their claim to help users have more great hair days between washes… YES PLEASE! What I noticed first about the Pantene Charcoal Collection shampoo was its amazing scent. Very light, fresh and just a hint of citrus, aka – my perfect combo. Infused with activated charcoal among a host of other hair-tastic ingredients, the shampoo is also free of silicone, parabens and dyes. The shampoo gets its light smokey color naturally from the charcoal. So why activated charcoal? Unlike skin, hair does not have a built-in purification system and so after three days of not washing your hair, the build-up can be a bit much! The activated charcoal acts as a purifier that attracts impurities like a magnet, while at the same time releases antioxidants helping it look refreshed and clean. The shampoo was a great consistency, not too thick or thin and was easy to work through my hair, especially at the roots where I always need the most “damage control”. It rinsed nicely as well and although it left my tendrils feeling fresh, it certainly did not leave my hair or scalp feeling overly dry or striped as other purifying shampoos have in the past. HUGE WIN! No wash would be complete, or in my case, even possible, without conditioner. And no, I’m not exaggerating, I literally CAN NOT brush my hair if I don’t use conditioner. So onward we go. 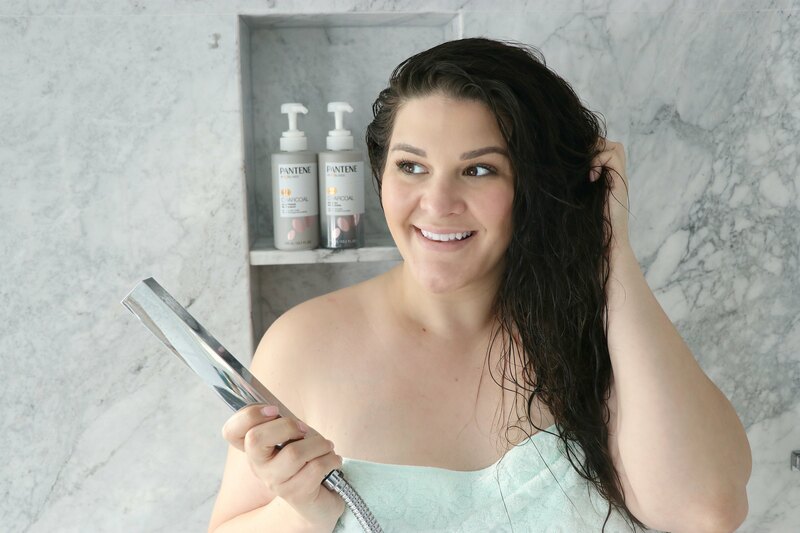 The Pantene Charcoal Collection conditioner is actually Pantene’s first-ever silicone free formulas that rinses out quickly leaving hair full and shiny. Unlike the shampoo, the conditioner actually uses white charcoal in lieu of the classic charcoal and gives it a white creamy color. Scent wise, it has the same tantalizing fragrance as its partner in crime. I also really enjoyed the fact that its thick consistency worked well distributing through my ends and caused me to use less product than usual. Now, the true test begins. I am a nighttime shower person and without fail, by the following morning I always need at least a tiny bit of dry shampoo at my roots. To my own shock, I woke up the next day with hair that looked just as good as it did the night before. I tossed a bottle of dry shampoo in my purse just in case and headed out the door. Work, gym, back to work, late lunch…and not a single touch up needed. PURE JOY! Throughout the rest of the day, my hair both looked and felt fresh. The next day my roots were beginning to show their true colors but not like usual, just a tiny hint of oil. A VERY light spray of dry shampoo and I was out the door. The same thing happened the next two days as well until it was finally time for another wash.
What I did notice is that obviously, I didn’t have to start using dry shampoo as quickly as I usually do, and more importantly, I used MUCH less than I usually do. But what really stood out to me more than anything, is the last day or two before a wash, when my hair tends to start not smelling, looking or feeling its freshest, it actually STILL felt good. Not at all weighed down, gritty, dirty or any of those other fun 3rd day hair synonyms. I could actually tell that the shampoo and conditioner really made a difference. Rather than having to resort to the standard 2nd day hair up do/ponytail, 3rd day hat routine to hide the dirt and oil, I actually was able to have my hair down and still look good. The new Pantene Charcoal Collection will be available for purchase at Target in mid-July! #WINNING!